BAYE FALL: ROOTS IN SPIRITUALITY, FASHION AND RESISTANCE. One of two exhibitions in conjunction with PhilAesthetic: AAMP celebrates the African Diaspora in Philly, this exhibition is a photographic series that visually engages the Baye Fall, an enterprising sub-group of Senegal’s notable Sufi Muslim Community, the Mourides. The Baye Fall possess a unique aesthetic that includes “locked” hair, patchwork garments, symphonic chanting and artisanal leather talismans and prayer beads. Through witnessing the lives of the Baye Fall, and the Senegalese cities in which they dwell, this series shows how pre and post-colonial politics have influenced their spiritual practice. The exhibition is traveling from the Museum of Contemporary Diasporan Arts (MoCADA) in Brooklyn NY. 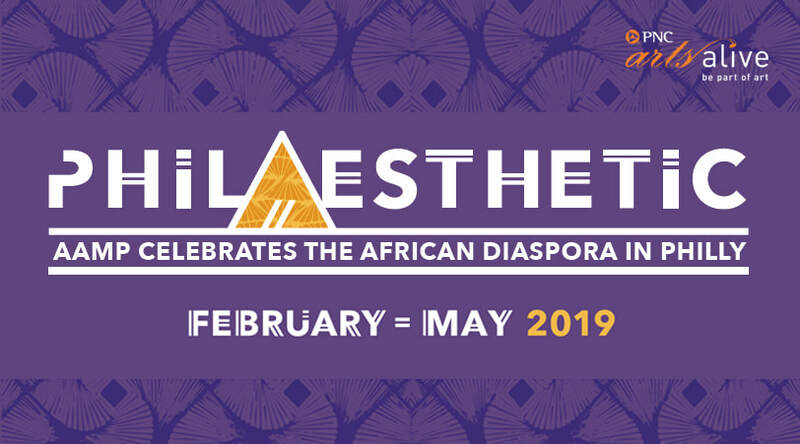 In conjunction with PhilAesthetic: AAMP celebrates the African Diaspora in Philly. As the only child in her immediate family born in America, Fawundu’s mixed media photographic works explore the tension between her family’s traditional Mende beliefs (Sierra Leone) and Westernized values. By incorporating ancestral gifts of colorful handmade batik fabrics and layering these complex and distorted histories, her work uncovers personal and universal cultural patterns that are present within herself and the African Diaspora. This year’s collections exhibition features rarely seen works on paper, including drawings, photography, paintings and prints from 20th century masters such as Elizabeth Catlett, Paul Keane, Hughie Lee Smith, Dox Thrash and Hale Woodruff and more. These works provide an intimate look at the some of the gems of the Museum’s works on paper via portraiture, landscape and abstraction.